*vFiler access is only possible over HTTP in the vFiler context - HTTPS is not an option. Why? options httpd.admin.ssl.enable is only an option in the vfiler0 context! 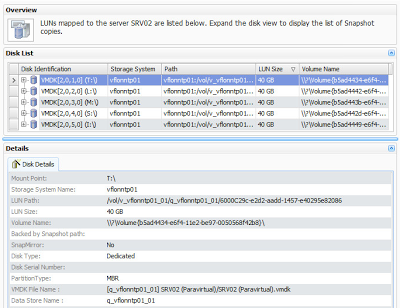 Not that it is absolutely necessary (but useful practice) - here we have created a local administrator account on our server called ‘local_sdw_svc’ with the same password as we configured when running the useradmin user add local_sdw_svc command earlier. The SnapDrive and SnapDrive Management Services are set to use the local account as below. 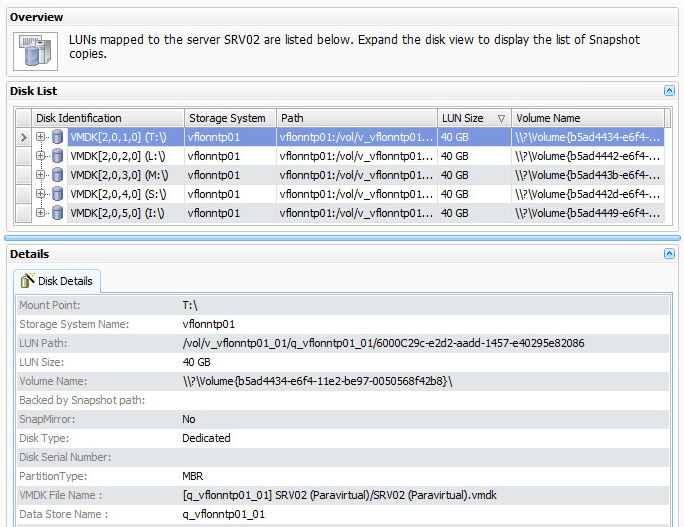 And proof that our VMDKs on NFS datastores presented by a vFiler are showing in SnapDrive for Windows! Q: If it possible to use RPC with a vFiler? A: Yes. If cifs setup has been run on the vFiler as in the preceeding post here, then RPC will work with a vFiler in just the same way. 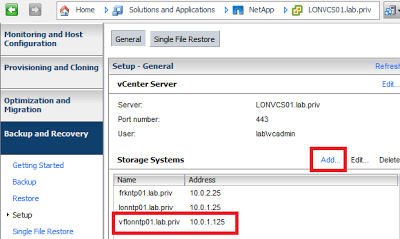 With DNS resolution etcetera … all configured correctly, there is no need to specify the vFiler as a Storage System under Transport Protocol Settings, and the Default ‘Use RPC’ can be enabled.